Orlando from BTSE works on a planting at Medford High School (Wicked Local Staff Photo/David Sokol). Arbor Day was celebrated on Friday, April 25, 2014. Barrett Tree Service East, joined forces with the Massachusetts Arborists Association (MAA) and other professional arborists to provide much needed tree care services throughout Massachusetts. Over 40 communities statewide received professional arboriculture services donated by more than 400 arborists. Partnering with local tree wardens, community leaders, and civic organizations professional arborists contributed their tree planting, safety pruning, and plant health care expertise at Arbor Day of Service project sites – large and small – including city parks, elementary schools, community playgrounds and town libraries. Barrett Tree Service East volunteer efforts concentrated on three sites: Jamaica Pond in Jamaica Plain, Mass Audubon's Habitat Wildlife Sanctuary in Belmont and Medford High School. Medford’s Tree Warden, Aggie Tuden directed the project at Medford high school’s courtyards as volunteers removed old trees, pruned others and planted new ones. "It’s wonderful that we have such committed companies to support Medford trees," said Tuden. Although April weather can be unpredictable, volunteers had a mild, sunny day to work. 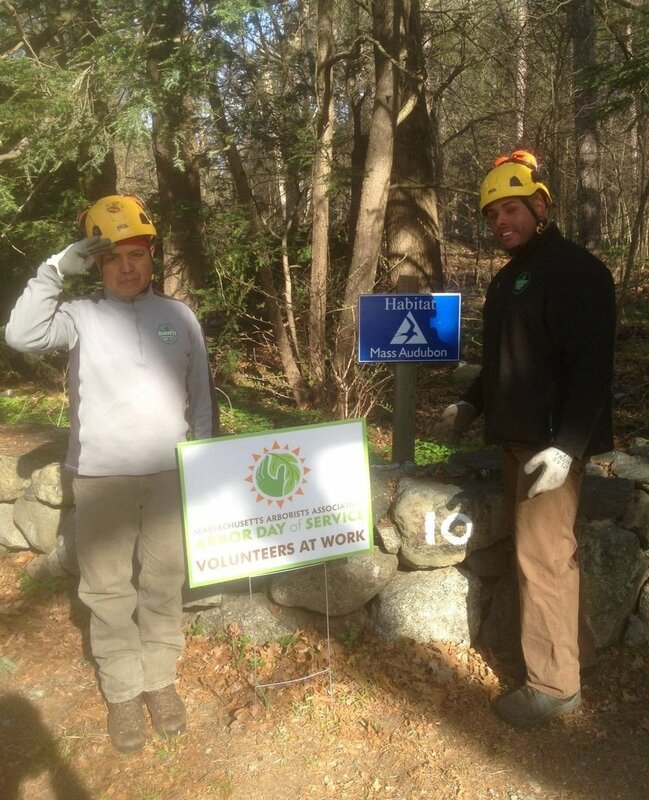 BTSE's Vincente & Roger volunteered their talents at Mass Audubon's Habitat Wildlife Sanctuary in Belmont. Barrett Tree East recognizes the importance of trees and proper tree care and is proud to lend our time and talents in MAA’s annual statewide Arbor Day celebration. In all, an estimated 3,000 volunteer hours and $300,000 in professional arboriculture services were donated in Massachusetts communities. MAA’s tradition of giving back allows us as tree care professionals to directly impact our local communities while in turn drawing attention to the importance of proper tree care, tree planting and preservation. We take pride in providing expertise and making a real difference in the communities in which we live and serve.